Fully revised for the latest building codes and industry trends, Metal Building Systems, Third Edition, explains how to select, specify, and design preengineered buildings with confidence. In this book, a practicing structural engineer goes beyond manufacturer-supplied specifications to provide impartial and objective information that can save you money and time. A new chapter on anchor bolts and embedments, many new illustrations, plus new and updated design examples, are included in this practical reference. End-of-chapter review questions reinforce the material presented. 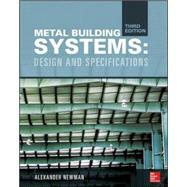 This is an essential resource for architects, engineers, construction specifiers, design professionals, facility managers, building officials, and contractors working with metal building systems.